Why is Smart Tracking necessary? What is an instrument landing system? In November 2016 Airservices implemented a new international standard Smart Tracking procedure on Runway 16 to improve safety, noise and emission outcomes for Melbourne Airport. Most aircraft movements around Melbourne Airport were unaffected. When Runway 16 is in use for landing, aircraft generally arrive using the Instrument Landing System (ILS) which is runway aligned from approximately 15km to the north of the airport. In good weather conditions, aircraft arriving from the west or south may also use a visual approach. This approach aligns with the runway closer to the airport at approximately 10km to the north. Using this visual approach also reduces fuel and emissions. Aircraft arriving on visual approaches navigate with visual reference resulting in a variation or spread of aircraft tracking as can be seen in blue in the image below. The new Smart Tracking approach procedures offer shorter routes than existing approaches. Airservices Smart Tracking procedures provide approved aircraft with improved guidance to the runway by using satellite navigation. Shorter approaches use less fuel and produce fewer emissions. Smart Tracking approaches are more accurate than the existing visual approaches and can appear more concentrated to some residents, however no new areas were exposed to aircraft noise as a direct result of implementing the flight path changes. Above: New Smart Tracking arrival flight path shown in white. Existing arrival flights tracks (which will not change) shown in blue. How many aircraft will use Smart Tracking? On a busy day, approximately 280 jet aircraft arrive on Runway 16. Of these flights it is estimated that up to 30 (approximately 10% of arrivals to Runway 16) may use Smart Tracking to land. These numbers are estimates based on data from a 12 month period (1 July 2013 – 30 June 2014). Arrivals to Runway 16 are generally the highest during spring and summer due to the wind directions. Further information on runway selection. Will there be more aircraft noise? No new areas were exposed to aircraft noise as a direct result of the new Smart Tracking flight paths, as these areas were already currently overflown by aircraft (both arriving to Runway 16 and departing from Runway 34). Residents in the Kalkallo, Craigieburn, Donnybrook, Mickleham and Oaklands Junction areas may visually notice a difference in where aircraft fly. While there may be a slight increase in the level of noise from these flights, it is not likely to be distinguishable due to the number of flights that already fly over these areas. When did this change begin? The updated flight paths was available for all suitably-equipped operators from 10 November 2016. A series of flight path changes came into effect at the Gold Coast Airport in August 2016. These changes are part of a nationwide Navigation Modernisation Program. The changes are in response to the Civil Aviation Safety Authority (CASA) and International Civil Aviation Organisation (ICAO) requirements for increased runway alignment and for all aircraft operating under Instrument Flight Rules to be able to navigate using satellite-assisted means when flying in Australian airspace. CASA and ICAO require Airservices to introduce these changes to ensure the highest levels of safety assurance is achieved in accordance with international practices and requirements. This flight path was previously offset from runway alignment by 9 degrees. The change reduces this offset to 5 degrees and moves the flight path slightly to the west. Aircraft noise is expected to fall within the existing corridor. The VOR and NDB approach procedure is used infrequently as it does not employ the most current technology and is retained as a contingency approach. This flight path was previously offset from runway alignment by 11 degrees. The change reduces this offset to 5 degrees. Aircraft will now cross the coast to fly over land between Surfers Paradise and Broadbeach, then continue south over Mermaid Beach before crossing the coast again and proceeding towards the airport over water. While tracking down the coast over water towards the airport, aircraft will now fly closer to land than previously. The VOR approach procedure is used infrequently as it does not employ the most current technology and is retained as a contingency approach. 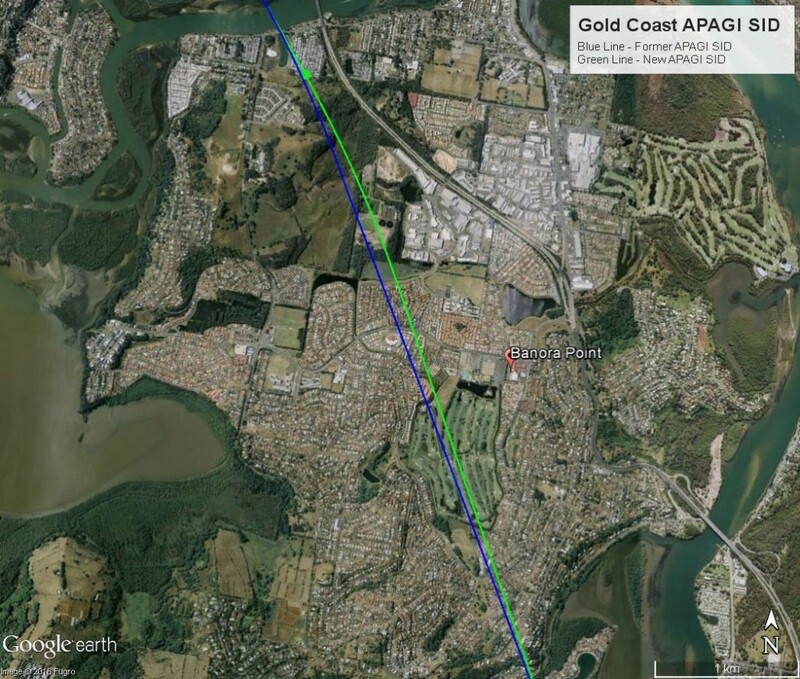 This flight path was previously offset from the runway by 12 degrees, producing a spread of aircraft traffic approaching the coast between Burleigh Heads and Currumbin to align with the runway. The new flight path will be runway aligned. Aircraft will now approach the coast at a more precise point at Palm Beach and fly closer to land than previously to align with the runway. Aircraft will remain over water until crossing the coast around Currumbin before landing. In 2016 Airservices and Defence performed a regular review of the changes that were made in 2015 and identified some minor adjustments required to ensure the highest level of safety assurance is achieved and that aircraft are managed as efficiently as possible. These changes came into effect on 26 May 2016. The changes either increased aircraft climb rates or modified the way aircraft turn when close to the airport in order provide more predictable tracking for aircraft. Some residents in the southern suburbs of Palmerston may notice changes to non-jet aircraft taking off from Runway 11, with a greater spread of aircraft by approximately 1km due to the altitude turn requirement. Howard Springs may also see a change in aircraft altitude and tracking, however, this is not expected to increase noise impacts. Airservices expects the proposed changes are not likely to be noticeable by the community due to the high altitude of aircraft and distance from the airport. There will be no new residential areas exposed to aircraft noise. Airservices will continue to inform residents on any updates as they come available and will work with Darwin Airport and the community to identify future noise improvement opportunities. Airservices proactively works with Gold Coast Airport and the community to minimise noise impacts where possible. To reduce the impact of aircraft noise on local residents and at the request of the community, Airservices trialled a change to a flight path for southern departures from Gold Coast Airport. The trial flight path change commenced on 8 January 2015 for southern departures on Runway 14 and continued for 12 months, to cover normal seasonal patterns of runway use and allow the community the opportunity to provide feedback. Airservices considers the trial did not achieve the intended noise reductions. The trial also unintentionally concentrated flights over Farrants Hill. Due to this, and in consideration of community feedback, Airservices has decided not to implement the trial flight path permanently. A process was undertaken to reinstate the Runway 14 departure flight path procedure which occurred on 23 June 2016. The original APAGI RWY 14 Standard Instrument Departure (SID) was re-evaluated using the latest obstacle data and the current valid CASA Manual of Standards (MOS) 173 and ICAO criteria. CASA validation was approved and submitted to Airservices for review and endorsement. National Request for Change (NRCF) process commenced. NRFC process was completed and the procedure was submitted for publication as an AIP SUP and will be effective on the next AIRAC date. The next available AIRAC publishing date is 23 June 2016. Reinstatement will be effective and the new procedure available for use 23 June 2016.
International Civil Aviation Organisation (ICAO) recommends that an aeronautical change submitted to AIP becomes effective 56 days after publication to allow adequate time for the data to be entered into the air traffic control system and aircraft flight management systems. Re-instating the pre-trial flight path required Airservices to update procedures in compliance with current design rules and limitations that were updated in 2015 (the pre-trial procedure was established in 2013). Due to this, there will be a small variation in the flight path that will be re-instated. The design rule requires a change in one Waypoint on the Standard Instrument Departure (SID). Whilst the waypoint locations are exactly the same, the waypoint closest to the runway had to be changed from a fly-by to a fly-over. This is due its close proximity to the runway which may cause the aircraft autopilot to turn well inside the waypoint and making the flight path corridor much larger than previously. A small section of the flight path corridor from the Terranora Creek (near Pacific Motorway) to the southern end of the Banora Point Golf Course may be up to 100m wider than it was previously (image below). This change will have no noticeable difference in aircraft noise at ground level. It is also unlikely to be a visible change in aircraft tracking. 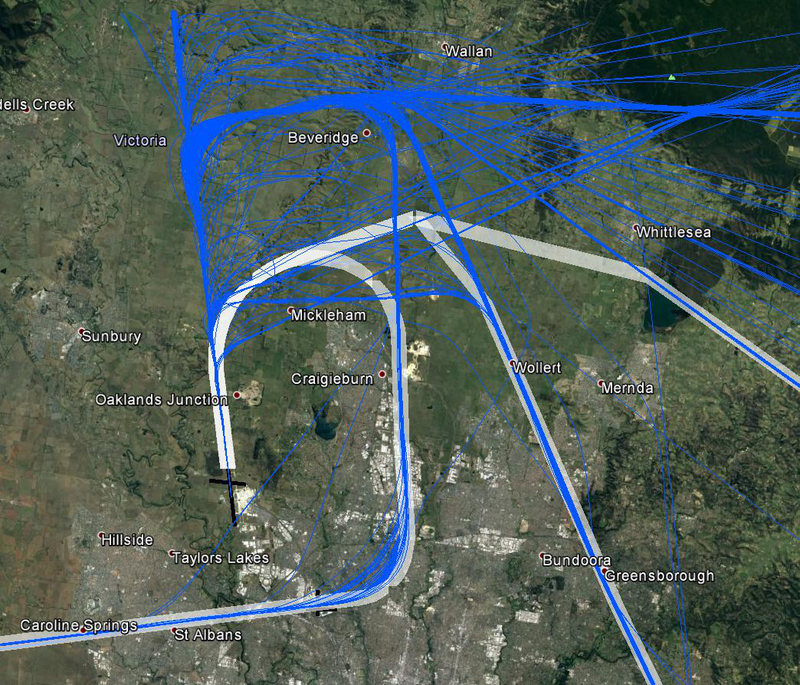 Aircraft have been using Smart Tracking flight paths in Townsville since 2011. On 10 November 2016 existing Smart Tracking flight paths to the north and south west of the airport were adjusted to meet the latest international requirements. These are set by the International Civil Aviation Organisation (ICAO). The updated Smart Tracking flight paths for aircraft landing from the north onto Runway 19 are not noticeably different to the previous flight paths. There are slight changes to the Smart Tracking flight paths from the south onto Runway 01, and residents in the Kelso area may notice a difference. There may be a small increase in the number of flights using Smart Tracking. Whilst these areas were already overflown by departing and arriving aircraft, residents may notice that Qantas and Jetstar are flying more predictable paths. More airlines are expected to adopt the use of Smart Tracking in the future.